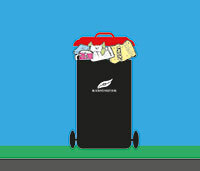 Your weekly bin collection will continue as normal during the Easter holidays and on Anzac Day. Bin collections are undertaken in Manningham every weekday, including public holidays. Your garbage bin is emptied weekly and your recycle bin and garden bin are emptied on alternate fortnights on the same day as your garbage bin. Please place your bins out the night before your collection day and return them to your property at the end of your collection day. When are my bins emptied? Download the Waste Collection Calendar 2018-19 (332.13 KB) to determine which waste collection area your property is in. Alternatively, contact us to have the Waste and Recycling Guide posted to you. If your bin collection day is Friday, you live in a designated high fire risk area. Please note that on code red days your waste collection services will be postponed. Please leave your bins out until they are collected. Please note a code red day is not the same as a total fire ban day. Learn more about the fire danger ratings. How do I place my bins for collection? Ensure bins are at least half a metre (50 cm) apart. Allow a minimum of 1 metre clearance from parked cars, trees, light poles or any other obstructions. Do not overfill bins and ensure bins are presented with the lids closed. Overfilled bins cause street litter. Extra bags next to the bins will not be collected. Please note the hydraulic arm on our trucks cannot collect bins that are heavier than 75kg. If you live in a court bowl or a hammerhead court you will need to place your bins on the straight section of the street for collection. No bins can be placed in the bowl or in the hammerhead of a court. If you live in a dead end street you may need to place your bins on one side to assist with collection. If you are not sure where you should place your bins for collection please contact the Waste Management Team. Bins to be placed only on one side of the street. We offer a collection service for residents who, due to frailty, disability, medical or mobility conditions, are unable to place their bins out for the weekly waste collection. Please refer to 'In home' bin collection service for more details.